I was down with the flu the past few days and while recovering the other day, was able to check out Lightroom, for photos I took, which I have not been able to do for the past few weeks. 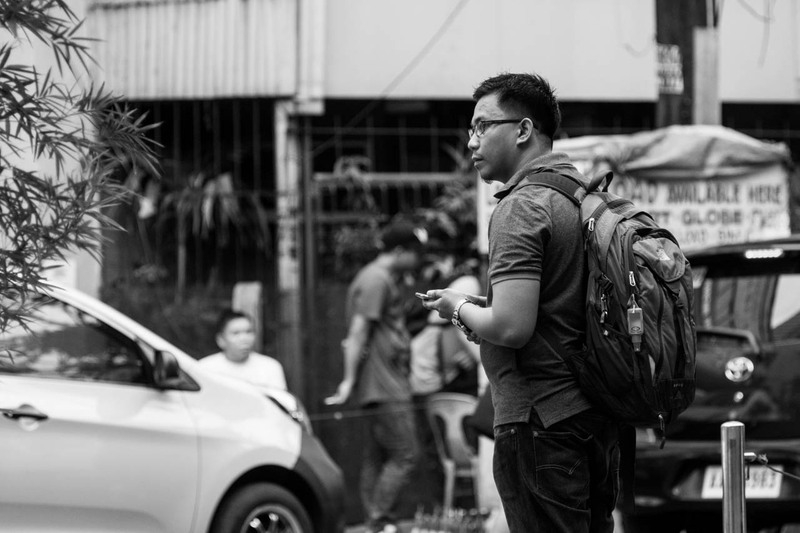 While going through months of images, I realized that I have this weird thing about gravitating towards framing people in backpacks while in the street, people with backpacks waiting for a ride, people with backpacks sipping coffee and other people-with-backpack stuff. Just realized the I have literally taken dozens of these types of photos. Most are not even well thought off, terribly composed and mostly just me fooling around with the manual focus. My tribute to this damned flu and to all of us backpack-lunging people, more backpack pictures. Taken while probably setting the focus on this manual lens, a Jupiter 37/A 135mm f/3.5, on an A6000. Black and white post-processing was done on Lightroom. See image on Flickr for EXIF. Filed under Street Photography. Tagged as Jupiter 37A, Manila, Sony A6000, Street Photography, Streets of Manila.